How do we make cities work for people? As a WRI Helms Fellow on Urban Governance and Sustainable Cities, Maria Antonia Tigre was tasked with answering this question. 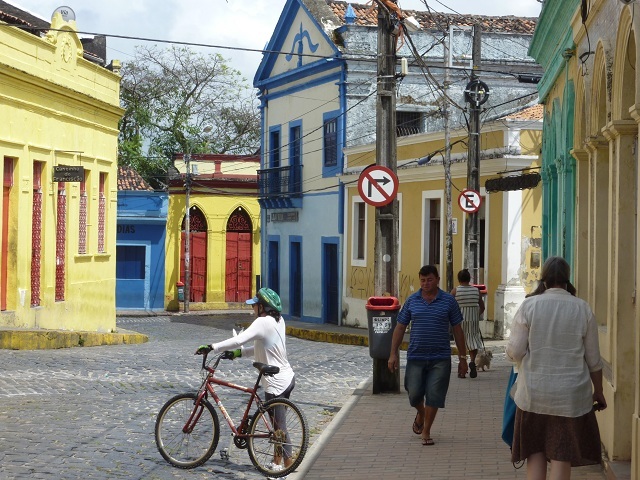 Through From ideas to implementation: creating sustainable cities with good governance here on TheCityFix, Maria will draw on her field research in two Brazilian cities—Rio de Janeiro and São Paulo—to explore the key governance gaps in urban planning, law, public policy, and institutions. Each part of the series will examine how reforms to urban governance can ensure that city-level decision making is transparent, inclusive, and accountable. At the end of September, world leaders approved an agreement at the United Nations Sustainable Development Summit that outlines global goals to be achieved by 2030, such as gender equality and the eradication of poverty. Of the 17 goals, one of the main objectives for sustainable development (goal 11) is to make cities and human settlements inclusive, safe, resilient and sustainable. In order to create a world that realizes this aspiration for urban areas, cities need good governance that is willing to foster change, track progress and be transparent. Each of the previous installments in “From Ideas to Implementation” has explored a common problem facing urban governance and suggested some ways to overcome them. 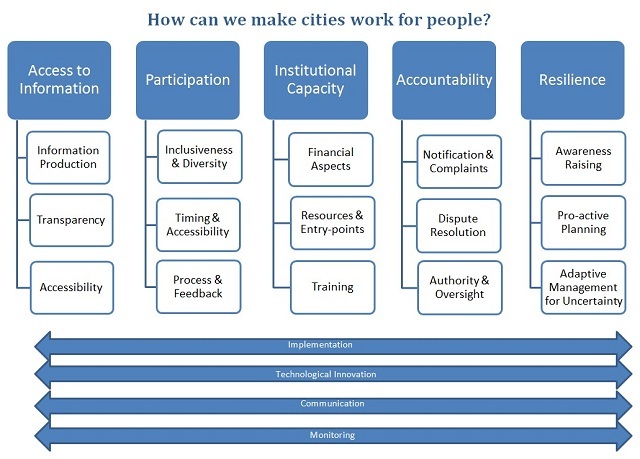 In sum, there are five key factors to making cities work: access to information, participation, institutional capacity, accountability, and resilience. For the majority of initiatives, implementation is everything. Consider, for example, Delhi’s attempt at constructing a bus rapid transit (BRT) system in 2008. In theory, BRT has a lot to offer the congested city—it would meet the demand for public transport, connect to the expanding Delhi Metro and cut down on local car use. However, the BRT system was not properly implemented, with poorly designed intersections, inaccessible stations and incomplete corridors. While the city had much to gain from BRT, it was eventually scrapped. What failures like Dheli’s BRT teach us is that successful implementation requires clear rules and objectives, as well as a well-defined implementation plan. Decision makers should systematize projects and procedures, introduce new measures in phases, and follow planned steps on a strict timeline. Problems can be anticipated by consulting best practices and evaluating how the local context will impact a project. Further, any major changes after the launch of a new program should be developed in stages in order to let citizens get used to them gradually. Finally, since changes in governance often require new legislation, decision makers should first approach initiatives on the legal front. Now more than ever, issues within governance can be addressed and made more efficient through technology. However, due to a lack in investment, many governments still use old systems, which waste time, money and resources. New tech can make information easier to distribute, improve public participation and boost transparency. For example, in Finland, citizens can pay taxes and apply for birth certificates or a driver’s license all online. From taxes to voting and banking, cities can find governance solutions easier to implement by innovating with technology—they simply need to invest in the new infrastructure. In addition, cities should utilize existing research to find better solutions to common problems. When research on a subject does not exist, incentives and partnerships with academic institutions can be created to encourage innovation. Implementing changes to governance require effective and clear communication in order to optimize resources and avoid confusion or distrust from the public. Good communication includes both internal communication—exchanging ideas within the government itself—and external communication, which occurs between the government and stakeholders. On the internal level, cities should place departments in dialogue to ensure that changes in responsibility are understood and to avoid redundancy. Externally, implementing new changes in governance—for example, the switch to online voting—must be actively communicated with the public to avert ambiguity, increase participation and get user feedback. By including citizens from the beginning, it is easier for officials to develop cooperation and discover frustrations that the public has with local governance. From accountability to access to information, all five ideas for improving governance hinge on the monitoring process. During my interviews in Brazil, one of the biggest problems individuals cited was the lack of monitoring and continuity of programs. For example, the favelas projects in Rio de Janeiro failed because officials did not monitor the implementation process—they simply installed the new infrastructure and left without teaching locals how to use it. Consequently, the developments, such as new sewage lines, fell into disuse and deteriorated. Furthermore, other projects fail because of political turnover, when a change in office results in old projects being scrapped. A way to avoid this is to systematize targets and goals regardless of the current administration, and assign external or community monitoring. Once projects are maintained by local communities (with support from the government), they are far less vulnerable to being uprooted by political shakeup. Implementing changes in governance and launching new projects is extremely difficult. However, by developing implementation strategies, drawing on new technology, communicating with stakeholders and monitoring progress, the rollout of new policies can be made smoother. While this is by no means an exhaustive list of the tools decision makers should have in their arsenal, these four tactics can serve as starting point for working towards good governance.